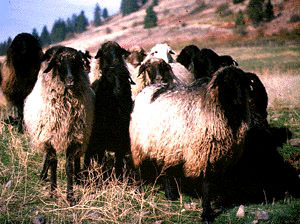 The Karakul may be the oldest breed of domesticated sheep. Archeological evidence indicates the existence of the Persian lambskin as early as 1400 B.C. and carvings of a distinct Karakul type have been found on ancient Babylonian temples. Although known as the "fur" sheep, the Karakul provided more than the beautifully patterned silky pelts of the young lambs. They were also a source of milk, meat, tallow, and wool, a strong fiber that was felted into fabric or woven into carpeting. The Karakul is native to Central Asia and is named after a village called Karakul which lies in the valley of the Amu Darja River in the former emirate of Bokhara, West Turkestan. This region is one of high altitude with scant desert vegetation and a limited water supply. A hard life imparted to the breed a hardiness and ability to thrive under adverse conditions, which is distinctive of the Karakul sheep to this day. Karakuls were introduced.to the U.S. between 1908 and 1929 for pelt production. Very few animals were obtained. U.S. breeders, in their eagerness to produce a large quantity of pelts, introduced other breeds into the bloodlines. This produced pelts of inferior quality and eventually the industry and the flocks were dispersed. Even in their native regions, the demand for furs resulted in a crossing and intermingling of native fat-tailed sheep so that the native flocks exhibit wide variations in type and color. This lack of uniformity is apparent. Body and fleece types vary even in those Karakuls capable of producing lambs of high quality fur. With a growing interest in the fiber arts in the United States, there has been an increased interest in the Karakul sheep. It is a specialty breed that is finding its niche as part of the cottage industry. The fleece is seen in a variety of natural colors. In its native region the colors are called by the following names; Arabi (black), Guligas (pink-roan), Kambar (brown), Shirazi (grey) and Sur (agouti). Occationally individuals are white or pied. This is partially due to its multiple uses: fur, fleece, and meat, along with the qualities of hardiness and adaptability. Today there are small farm flocks scattered throughout the U.S. The harsh conditions under which they evolved has given them strong and lasting teeth, a key to their longevity. They are resistant to internal parasites and foot rot. While they respond to good feed and care, they are excellent foragers and will go through a season of scant food or graze marginal land in which ordinary sheep would not survive. Karakuls withstand extremes of either hot or cold but they should have access to dry cover and be kept out of marshy pastures. Karakuls breed out of season, making it possible for three lamb crops in two years. Single lambs are the rule, although twins are born occasionally. The ewes are very protective and attentive mothers, resulting in a high lamb survival rate. The Karakuls posses a strong flocking instinct and can be run either on open range or in fenced pastures. They do not herd well; they are likely to scatter or fight a dog trying to herd them. The Karakuls differ radically in conformation from many other breeds. They are of the fat broadtailed type of sheep. In their large tail is stored fat, a source of nourishment, similar in function to the camel's hump. The narrow appendage below this fat sack is often recurved, giving an S shape. Karakuls are medium-size sheep. The rams will weigh between 175-225 pounds and the ewes range from 100-150 pounds. They stand tall, with a long, narrow body. The top line is highest at the loin with the rump long and sloping, blending into a low set broadtail. The head is long and narrow, slightly indented between the eyes and often exhibiting a Roman type nose. The long ears are always pointing downward and slightly forward and vary from a long U shape to small V shape, or may be entirely absent. The long neck is carried semi-erect. The legs are medium to long, and light in bone. Rams can be polled or horned; horns vary from short to large outwardly curved spirals. Ewes are generally hornless. Wattles are not unusual. 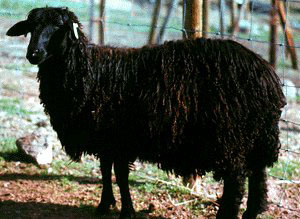 The Karakul is distinguished by its colored fleece, which is due to a dominate black gene. Most lambs are born coal black with lustrous wavy curls, with the face, ears, and legs usually showing smooth, sleek hair. As the lamb grows, the curls opens and loses its pattern and the color generally begins to turn brownish or bluish gray, getting grayer with age. Other colors include a wide range of shades; silver blues grays, golden tans, reddish browns, white with flecks of other colors include a wide range of shades; silver blues, grays, golden tans, reddish browns, white with flecks of other colors and occasionally pure white. Many adults have a double coat, a fine down undercoat, covered by a coat of guard hair. The best have a fleece as glossy as their lamb coat. But there is a great variability in the fleece type of both coats, from "horse tail" coarse to silky soft. The Karakul produces a lightweight, high-volume, strong fiber fleece that, at its best is long and lustrous, usually with no crimp. Considered long-stapled (average 6" to 12" per year), the fleece lacks a high grease content. It is easily spun, with little preparation. It produces a superior carpet yam, is often used for rugs and saddle blankets, outer garments and wall-hangings, and has an excellent felting ability. It is the wool from which the art of felting evolved. The American Karakul Sheep Registry is a roster of the U.S. Karakuls to the degree that it is supported by the Karakul breeders. As an organization it has evolved from the Karakul Fur Sheep Registry founded in the 1930's and is now recognized as the national registry for the breed. It is open to all breeders of quality Karakuls. Its purposes are to provide a recording service, to work towards a high standard of quality in the Karakuls and to promote and thereby preserve the breed in the U.S. The Karakul is considered a rare breed in the U.S. and most likely will remain so; current population is estimated at 1300 animals. Large flocks are still to be found outside the U.S. especially in Central Asia and South Africa. All current U.S. stock is descended from the original importation and the importation of new bloodlines is restricted by government regulations. The goal is to upgrade the current stock with selective breeding, to a Karakul of pure type.